As per the variegated requirements of our clients, we are offering a broad collection of Exhaust Gas Analyzer. This analyzer is manufactured using exceptional quality components and advanced technology by our deft professionals. In order to make sure quality, this analyser is strictly tested on various parameters by our experts. Apart from this, remarkable quality and sturdy structure increase the demand of our offered range in the market. 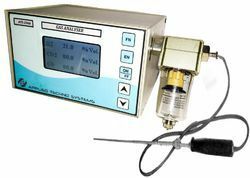 Applied Techno systems is specilize the manufacturing of flue gas analyser for stack, boiler exhaust application having tempreture range of 0-600 deg c and 0-1200 deg c with specieal tempreture sampling probe. Our organization has successfully expanded its business in market owing to the offered elevated quality array of Fuel Efficiency Analyser. The offered analyzer is manufactured utilizing best quality components and the advanced technology. It helps to measure various gas pollutants in the exhaust for environmental reasons. Moreover, a team of our quality controllers conducts a series of quality tests on the entire range to seek out any possible defect. In tune with industry standard, we provide the entire array in various customized options and industrial leading prices.